John Berggruen Gallery is pleased to present an exhibition of new paintings by Nathan Oliveira. Singular opens Wednesday, September 12th and will run through Saturday, October 20th. A reception for the artist will be held on September 12th from 5:30pm to 7:30pm. 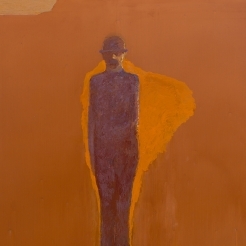 Nathan Oliveira, associated with the Bay Area Figurative movement led by Richard Diebenkorn, David Park and Elmer Bischoff, continues to paint solitary figures and objects which captivate us with their rich earth colors, deeply textured yet balanced brushstrokes, and vibrant spirituality. Oliveira’s lone figures (whether in movement or at rest) are so alive that we get the feeling that as soon as we turn away from them, they will continue moving gracefully about their own private worlds. We are momentarily allowed into their intimate realms, but ultimately denied access as we realize that each ethereal figure is at peace with his own solitude. Dedicating this exhibition to Balthus, Oliveira reminds us of the modernist painter in his ability to innovate within a traditional framework. Oliveira paints with no tricks or gimmicks, merely with a talent and passion that are distinctive and singular to the painter himself. A retrospective exhibition of Nathan Oliveira’s work will be on view at the San Jose Museum of Art from February 8th through May 12th, 2002. The retrospective then travels to the Neuberger Museum of Art in Purchase, NY; the Palm Springs Desert Museum in California; the Orange County Museum of Art in Newport Beach, CA; and the Tacoma Art Museum in Washington. Nathan Oliveira was awarded the distinguished degree of “Commander” in “The Order of the Infante D. Henrique” by the President and Republic of Portugal and was presented with an Honorary Doctorate of Fine Arts from the San Francisco Art Institute. Nathan Oliveira’s work is seen in the public collections of the Art Institute of Chicago, the Boston Museum of Fine Arts, the Corcoran Gallery of Art, the Hirshhorn Museum, the Metropolitan Museum of Art, the Museum of Modern Art, the Solomon R. Guggenheim Museum, the Tate Gallery, the Whitney Museum of American Art, and many more. Singular will be accompanied by a full-color catalog with an essay written by Peter Selz, PhD. and Professor Emeritus, History of Art, University of California, Berkeley. A book on Nathan Oliveira, written by Peter Selz, Nathan Oliveira, and Jo Ann Moser, will be published by the University of California Press in March 2002.